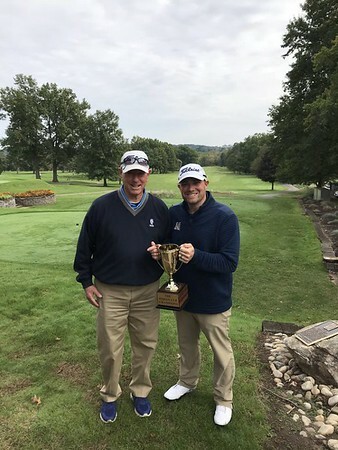 NEWINGTON - Last Sunday at at Indian Hill Country Club the Newington High School Golf Program held the first annual Indian Cup for alumni and coaches. The event was a two-person best ball format that included each player’s current USGA handicap to level the playing field. 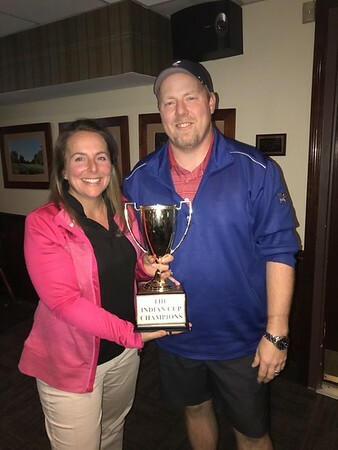 The winning score was an impressive 62 (-10) turned in by Rebecca Ribeiro ’96 and her brother Grant Gatzen ’92. Rebecca was the first female golfer in the 25-year tenure of Coach Richard Condon. The idea of the annual tournament was hatched during a day of golf between class of 2018 players Noah Hedberg, Max Turgeon, Ben Weyman, and current Head Boy’s Coach Jayson Barbarotta. Once Indian Hill Head Golf Pro Wayne Smyth joined the conversation, the idea quickly became a reality. This year 14 former players and five coaches returned to “The Hill” for a day of golf, laughs, and reminiscing. The returning alumni included: Aaron Donnelli, Ben Weyman, Brett Bishop, Chloe Bilodeau, Courtney Oushanna, Grant Gatzen, Jimmy Ellis, Kirsten LaPointe, Max Turgeon, Michael Strong, Noah Hedberg, Phil Hatje, Vinny Lanza, and Rebecca Ribeiro. Current Boy’s Head Coach Jayson Barbarotta, current Girl’s Head Coach Rich Condon, current assistant coach Rob Miller, former coaches Frank Cardona and Tom Righi, as well as Head Golf Pro Wayne Smyth also participated. The top five teams were: 5) Cardona/LaPointe 68, 4) Barbarotta/Hedberg 67, 3) Righi/Turgeon 66, 2) Condon/Donelli 65,1) Gatzen/Ribeiro 62. The 2019 Indian Cup will be held in August at Indian Hill and the program looks forward to adding to the field and making the event bigger and better each year. If you are an alumni of the NHS Golf Program please feel free to reach out to the coaches for information. , their contact information can be found on the Newington High School Athletics website: http://golf.newingtonathletics.com. Posted in Newington Town Crier, Newington News on Wednesday, 17 October 2018 14:38. Updated: Wednesday, 17 October 2018 14:40.